OAKLAND, Calif. (October 4, 2007) – The Old Oakland Outdoor Cinema’s 2007 series will conclude on October 20, with the screening of “Babe.” This family comedy follows the exploits of a sheepherding piglet and his talking barnyard friends. The series transforms Ninth Street between Broadway and Washington into an outdoor cinema with movies beginning at dusk. Limited seating is available; filmgoers are encouraged to bring their own chairs and blankets. Released in 1995, “Babe” follows a piglet as he searches for his place on the farm. After the homesick piglet is befriended by a sheepdog, hilarity ensues as he learns to herd sheep. This family friendly film uses computer animation to make it look as if the animals in the movie are talking. The ground-breaking animation resulted in the film garnering an Oscar for Best Visual Effects. The film went on to win an additional 16 industry awards. To overcome the challenge presented by the quick growth rate of piglets, 48 real pigs plus an animatronic double were cast in the role of Babe. Movie goers can arrive early and enjoy a tasty dinner at one of Old Oakland ’s many fine eateries. Cuisine varies from pub food and juicy steaks to Cajun seafood and sushi. For more information on restaurants and cafes in Old Oakland, visit oldoakland.org. During the movie, free parking is available at 8th and Washington streets. 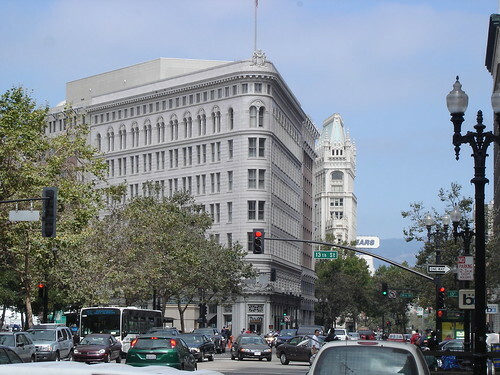 Old Oakland is just one block away from the 12th Street /City Center BART Station. Fresh, free popcorn, sponsored by Market Square II – Old Oakland’s newest condominium community, will be available while supplies last. The 2007 Old Oakland Outdoor Cinema is presented by the City of Oakland in association with the Old Oakland Historic District Business Association. For more information on the cinema series, call the Oakland Film Office at (510) 238-4734 or visit filmoakland.com. This entry was posted on Thursday, October 4th, 2007 at 12:57 pm. It is filed under Special Feature. You can follow any responses to this entry through the RSS 2.0 feed.